Lateral Em Soft Pvt. Ltd.
To meet the various requirements of the customers, we are involved in offering a wide assortment of Automatic Wheather Monitoring System. v With effective Energy monitoring consumption reduced by 20%. v VAR reduced from 90kVAR to 70kVAR. v Accurate Feeder consumption monitoring w/o human errors. v Lift operation & consumption monitoring to make it maintenance free. This system is based on advanced microcontroller technology. It can log temperature from -50 degree to +40 degree. It can store 10000 readings and can take temperature reading at regular interval (1 min - 60min ). 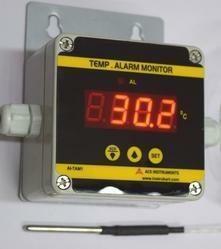 It is battery backed system so can be used as stand-alone temperature monitoring system. Monitor Rack Temperature and send audio hooter alert when temperature rise from desired set value. This system can be used in any other application where temeperature is critical and should be under control by 24x7. Easy in installation. User can install himseleve with in 10 minutes without system expert. receive alerts both through the system and SMS. The temperature monitoring is essentially used for safe operation of cast resin / dry type transformer. It is suitable for control room as well as marshalling box installation and is built for Ion and trouble free operation under extreme conditions of service associated with transformer. 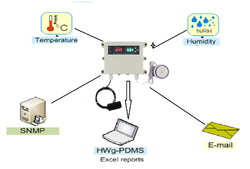 We are always forcus on Ambient Temperature Monitoring. Our main aim is customer satisfaction & thus no issues should be involved. Enables flow monitoring of barrel heating fluids, thermal transfer fluids such as syltherm® coolant flows through heat exchangers, as well as flows through hydraulic circuits and sub-circuits with elevated temps. Alarm annunciators are designed to keep an alert and watchful eye on the various machinery on board a vessel. Our PLA series of Alarm annunciators are field proven devices.